Aquaponics is a sustainable food production system. In a country with a food self-sufficiency rate of 39%, this was bad news. 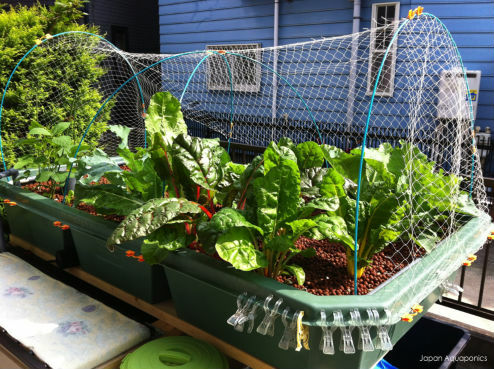 “Straight away I realised aquaponics was something that could be used in Japan”, St-Charles said. Aquaponics is a closed and sustainable food production system that involves the cultivation of plants with the raising of aquatic animals—in this case, fish—in a circulating ecosystem. Water from the tank containing the fish and, thus, full of nitrogen and ammonia-rich fish manure, is drained into a grow bed filled with gravel or lava rock. The plants soak up nutrients from the water as the fish waste is broken down into plant-useful components by naturally occurring bacteria. The cleaned water then returns to the tank where the cycle begins again. The Tohoku region, most directly affected by the March 2011 triple disaster, continues to recover. Yet there remains plenty of work to do. Some experts estimate that the debris clean-up will take over 19 years, while saline soil needs at least three years again to be viable. Recovery also means rebuilding. Physical structures—homes, businesses and government buildings—now dot the landscape and farmers are striving to rejuvenate their soil. The task of reviving rural economies and communities remains daunting, but not hopeless. In a region famous for its traditional agrarian lifestyle, St-Charles believes that aquaponics is a very real and sustainable solution. “You can put [an aquaponics system] on damaged soil that can’t sustain life because it’s contaminated. You can put it in Tohoku, where it’s very difficult to grow anything on land that now is saline. You introduce aquaponics there and [vegetables] are going to grow”, St-Charles stressed. During a year-long sabbatical from his work as a legal recruiter, St-Charles set up a firm, Japan Aquaponics, and began designing and building systems of various sizes. He also began searching for a place where he could set-up a demonstration model. “We wanted something we could donate to Tohoku so people could see it. We wanted to show them how it works and that it’s quite easy [to operate]”, he said. In September, St-Charles set up his first demonstration system in Minamisanriku, Miyagi Prefecture, one of the communities hardest hit by the tsunami. Funded in part by the Australian and New Zealand Chamber of Commerce in Japan, and a private donor, this system can be found inside the community centre set up by the non-profit organisation O.G.A for Aid. Fashioned from a wardrobe kit made by the Swedish furniture designer and maker IKEA, as well as yoghurt cups, polystyrene, two professional grow lights donated by SODATECH-ACE, and various other materials, the system is already producing its first crop. “The last thing I did was sprinkle a bunch of lettuce seeds on the top. Now they’re about that high”, he said, indicating a height of around six centimetres. St-Charles has estimated that the system, with its 250L fish tank and two grow beds, could produce 17 crops a year. While it may not feed the whole community, it will offer fresh greens in winter or supplement a family income. For St-Charles and Tohoku, it’s a welcome harvest. 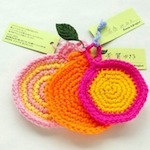 Hand-knitted by elderly evacuees in Tohoku, bright little washing-up scrubbies clean dishes in no time, without the need for lots of washing-up liquid. For every set of three purchased, ¥100 goes to the maker.